It's what they do best! I think the best part of sharing our lives with this breed is how much fun they are, and how they really live life to the fullest. As these pictures show, they are happy dogs and we strive to give them plenty of time to play and enjoy life. And in joining in their play, they keep us young at heart as well. 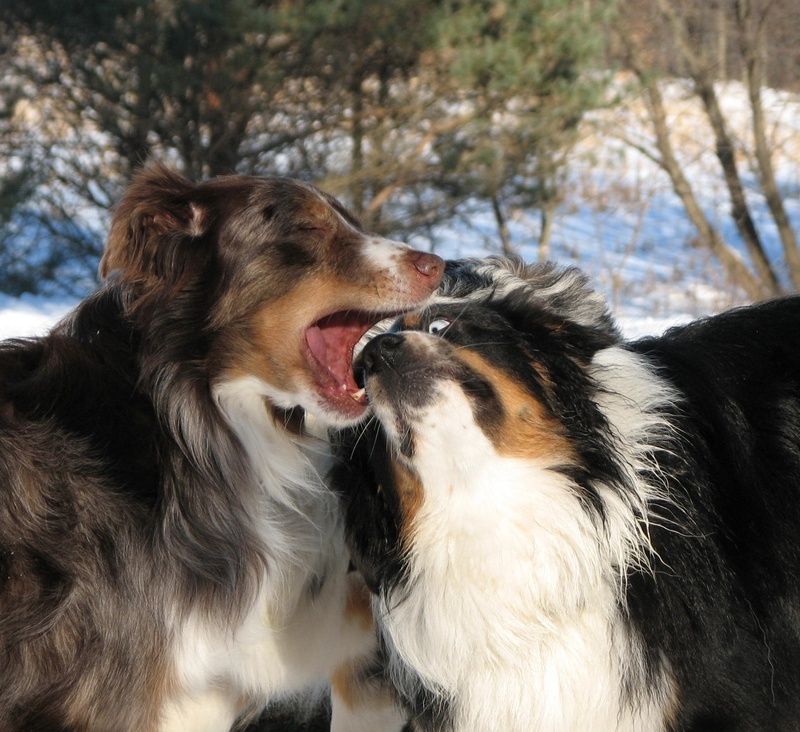 The pictures were taken during regular play time as well as when friends brought their Aussies to join us. Since I tend to take a lot of "fun photos" there is no way I could put all the best on one page. I have made two more "fun photo" pages so if you like these kinds of pictures, definitely check them out too! Even though this picture is blurry, I had to include it. Look at the expression on the face of the dog on the right. She is flying through the air, too! The puppy is planning her move, and then TAKE OFF! They don't call her "Air Darcy" for nothing! She's a kangaroo dog! "I think you have a squirrel stuck in there!" Run!! Run from the Giant Slobberknocker!!! In the series below, a puppy was having fun playing in the air stream from the blow dryer. She loved that game! Below are some hilarious "peanut butter faces"
"...God has brought me laughter, and everyone who hears about this will laugh with me."